Let the merry making begin with Purl Soho's Pom Pom Kit! 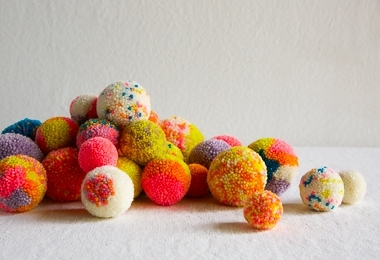 Step-by-step instructions dispel the mystery of making the perfect pom pom, not just a one-color classic, but special designs, too, like all-over sprinkles, patches of color blocks, and scattered polka dots. You'll also learn how to combine designs for your own custom remixes. Each kit includes a fun bouquet of six skeins of our Pocket Posy, a great yarn for long-lasting fluffiness. You'll also find our Pom Pom Maker Set, a brightly colored Plexiglass tool set that includes two U-shaped makers, plus six trim guides for giving tidy pom pom haircuts. We say, bring pom poms to the party… And the more the merrier! Click Product Details, above, for more information. 6 skeins of Purl Soho’s Pocket Posy (75% superwash merino, 15% cashmere, 10% nylon) in the colors Heirloom White, Sour Gooseberry, Marigold Orange, Pink Papaya, Winter Heath, and Beetle Blue. Featuring spring-action blades made of high-grade, precision-ground stainless steel, these Easy Action Scissors are great for righties or lefties and are our favorite scissors for trimming pom poms!